to keep the air circulating, especially in the winter. air from the A/C into the tent ends. But what is the cost of those fans? another project to save you $$$. I LIKE DOING THAT ! I found these little 12v fans at a tractor supply store.They came with a cord that you can plug into your car plus you can install batteries to power the fan. 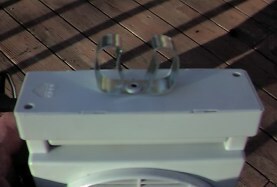 I tried the batteries and it did ok but nothning like when you powered up the fan on 12 v. I took a closer look at the fan and decided that all I need to do is to install a clip on the bottom of the fan so that you could attach it to the upper tent bar. 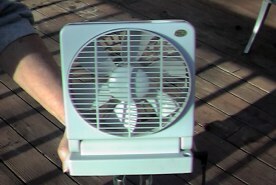 Here is a picture of how I install the grip clip on the bottom of the fan. I just used my rivet gun and installed a rivet to hold it in place. 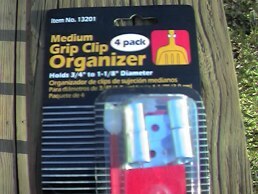 This is what the package of grip clips looks like. You can purchase them just about any place. 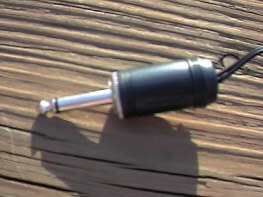 I found mind at Lowe"s.
The next thing I did was cut off the car plug and install a phono plug so that I could just plug it into my camper light. Well here it is !! 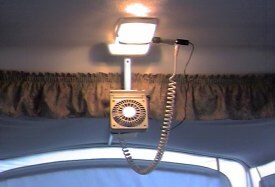 The coil wire you see goes to my tent end light. I just had a double female plug laying around and plug both the light and fan into it. Don't try to run all of the lights and the fans at the same time cause it will blow the 10 amp fuse. It did mind!! Cut off some of your lights. What did this little project cost ?? This does not include the 2 rivets !! !